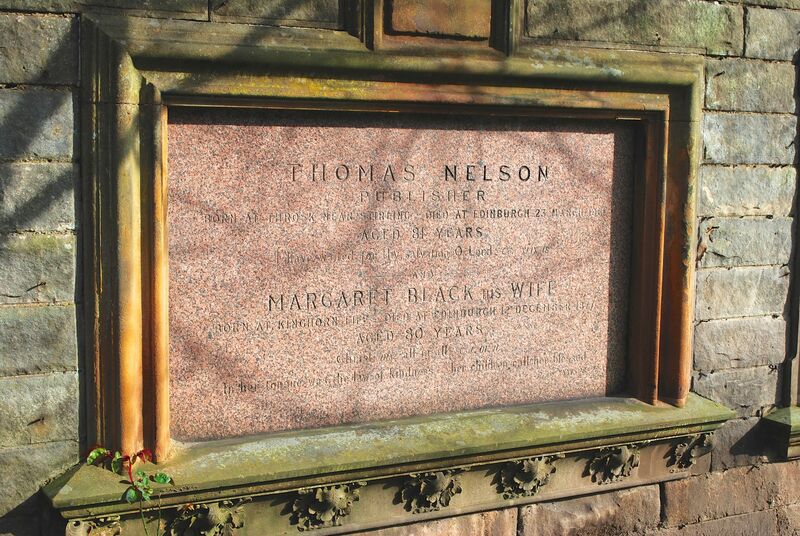 Thomas Nelson was the founder of Thomas Nelson the publishers, who were the largest printing and publishing company in Scotland in 1853. The venture started in 1798 when he opened a second-hand bookshop in the West Bow in Edinburgh. In 1845 he moved to Hope Park End (now Hope Park Crescent), building a new printing house where the complete book manufacturing process was carried out under one roof. He was joined by his sons, William and Thomas junior, who contributed greatly to the firm’s success. In 1850 young Thomas invented the rotary press, which revolutionised printing, and in 1854 William set up a subsidiary in the United States. An office had been opened in London in 1844. Thomas senior died in 1861. In 1878 a fire devastated the Hope Park site. The Council offered temporary accommodation and, within two months, Thomas Nelson and Sons were back in operation. They moved to new, larger premises at Parkside where, with better equipment, they were able to produce books at inexpensive prices. From the start, Nelson’s specialised in religious works, to which they added educational material and popular classics. After the deaths of William and Thomas junior, the firm was run by a nephew, George Brown, until Thomas’s sons, Thomas Arthur and Ian could take over the running. In 1900, three new series of pocket books were launched: New Century Library; Nelson’s Sixpenny Classics; and Nelson’s Classics. They soon became world famous. The firm remained in the family’s hands until 1962 when it was bought by the Thomson Organisation. Thomas Nelson was born in Throsk, near Stirling, in 1780. 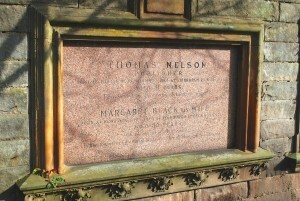 His surname was originally Neilson, but he changed it to Nelson as it was easier for his customers to remember. In 1814 he married Margaret Black (1796-1877), some 16 years younger than him, from Kinghorn in Fife. They had seven children, four boys and three girls. Two sons entered the business; John became a minister; and James became a doctor. Thomas died in March 1861, and Margaret in December 1867. Thomas’s memorial is surrounded by those of his family. To the right is that of his son John Nelson, the minister (1820-1878). To the immediate left is that of Thomas junior (1822-1892) and his wife, Jessie Kemp (1846-1919). A son, Thomas Graeme died (1876) at just 18 months old. Another son, Thomas Arthur (1876-1917), was killed by a stray shell in France in 1917. To the left of this plaque is one to Thomas’s daughter, Margaret (1829-1894), who married the solicitor John Adams. Also commemorated are her sister, Jessie (1834-1924), and brother, James (1826-1896). Tucked in the corner is the monument to William Nelson (1816-1887) and his wife, Catherine Inglis (-1904).